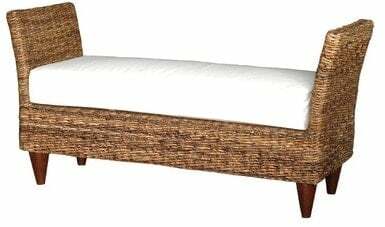 One of my must-haves for our in-progress master bedroom makeover is a bench at the end of the bed. Not only does it look good, but bedroom benches are a great place to sit and put your does on or to lay out clothes for the next day. I’m hoping to find a bedroom bench that works with our Pottery Barn bed. 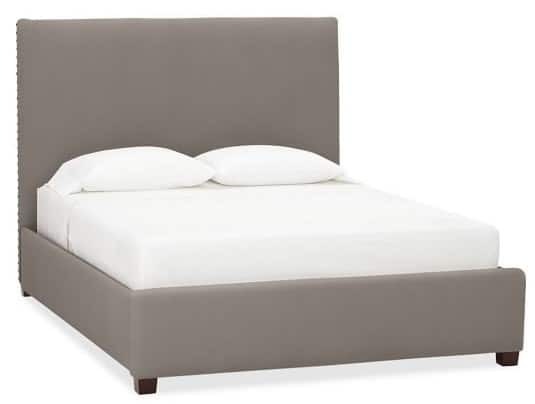 It’s the Raleigh bed by the way, in Gun Metal Gray. There’s many different styles of benches out there but I’ve rounded up 12 of my favorites. I haven’t quite decided which one I’m going to purchase yet. Which one is your favorite? 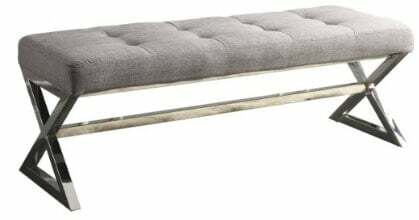 I like this Home Elegance Metal Base Bench but I’m not entirely sure the metal legs are my style. I love the tufted top but I’m thinking wood legs might work better. This bench is a real contender. I love the nailhead trim and the swoop arm detail. I’m not crazy about the black legs but I could always paint them if they really bothered me. Can I say wow? This upholstered bench is beautiful. Everything from the weathered wood to the nailhead trim is spot on. Everything except for the color. I really have my heart set on a medium to dark gray to tie in with our bed. This bench from Mira Abaca would not work in my room at all. But it’s so beautiful that I had the share. 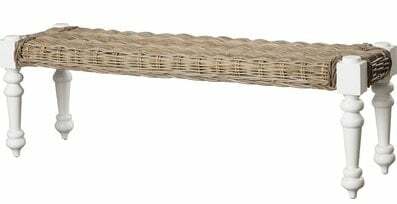 I love rattan! Again, this Parkland Bench from Fieldcrest Home is stunning and wouldn’t look out of place in a Fixer Upper makeover! But alas, won’t work in my room! This little country style bench is TOO cute. I’m totally digging the mint but it might have to be moved to a spot besides the end of the bed. Then again, I kind of want this for my hallway. Or my kitchen. Or under the window in my living room? I just love it!! Finally, this roll armed bench from ATG Stores ticks most of the boxes that I’m looking for. I’m not totally in love with the very turned legs but I think I could get over that. Out of those 7 benches which is your personal favorite? And which do you think would work best with my bed? I love the one with the nail heads and swoop arm. Can you tell me where you found that?? Thanks!! Hi Lenna – all the links are in the post! I love the first one with the metal base, I have been into mixing the metals and distressed woods together lately. 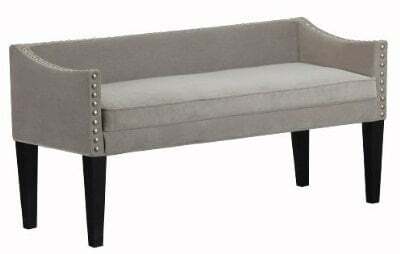 For your room, I love the Elements bench, I know you said you were wanting the top to be gray to tie in with your bed, but maybe you could add a throw on it that matches your bed…would that work? I love the one with the metal base too…it would have worked perfectly in our first home. I agree with the Elements one and I was thinking of a throw blanket or pillow to tie the colors together. Thanks for the suggestion!